McCormick Ground Allspice is named 'Allspice' because its flavor resembles a blend of cloves, cinnamon and nutmeg. Allspice imparts a rich, warm flavor to most slow cooked meals. Jamaican soups and stews require a few Allspice berries. Allspice flavors German sauerbraten and English traditional spiced beef and plum pudding. Try allspice in baked goods and mulled drinks. The culinary description of allspice is that it has a woody, cinnamon-like flavor, which is slightly numbing. The flavor of Allspice suggests a blend of cinnamon, nutmeg, and cloves. Allspice is the dried, unripened fruit of Pimenta Officinalis Lindl, a small evergreen tree of the myrtle family and the whole Allspice is a pea-sized berry which is usually sun-dried to a reddish-brown color. Allspice is very versatile and enhances the flavor of most other spices. So Allspice can be used in both sweet and savory dishes. Such that Allspice complements beef, pork, chicken, sausages, fish, cheese, pickles, stewed fruit, and cakes. Add whole Allspice to marinades, soups, stews, sauces, and to liquid for poaching, steaming, or boiling fish or shellfish. 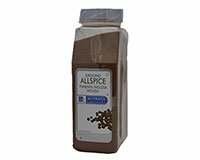 Use ground Allspice in cakes, pies, cookies, meatloaf, sauces, dressings, sweet potatoes, and squash. Allspice is an important ingredient in German, Middle Eastern and Caribbean cuisines.